Images of faces, represented as high-dimensional pixel arrays, often belong to a manifold of intrinsically low dimension. 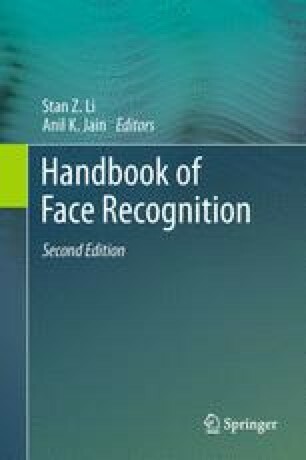 Face recognition, and computer vision research in general, has witnessed a growing interest in techniques that capitalize on this observation and apply algebraic and statistical tools for extraction and analysis of the underlying manifold. In this chapter, we describe in roughly chronologic order techniques that identify, parameterize, and analyze linear and nonlinear subspaces, from the original Eigenfaces technique to the recently introduced Bayesian method for probabilistic similarity analysis. We also discuss comparative experimental evaluation of some of these techniques as well as practical issues related to the application of subspace methods for varying pose, illumination, and expression. We thank M.S. Bartlett and M.A.O. Vasilescu for kind permission to use figures from their published work and for their comments. We also acknowledge all who contributed to the research described in this chapter.